The following location guides offer information and descriptions on some of the most beautiful natural landscapes around the world. When clicked on, each report highlights regions of profound natural beauty along with accompanying photographs and descriptions. I have spent years carefully planning trips and photoshoots around capturing unique landscape photography locations and these guides are the result of that work. Some of the most dreamlike, fog-filled mountain landscapes in the world are located in central China. These natural scenes are so stunning and unique that they have provided inspiration for painters, poets, and writers for almost two millennia and now serve as a major source of China’s natural landscape identity. Of particular beauty are three distinct areas: the towering granite spires of Huangshan, the sandstone pillars of Zhangjiajie/Wulingyuan, and the verdant karst peaks of Guilin. Year-round humidity and dense vegetation at these locations frequently produce dramatic fog, adding to the profound mystery and beauty of these scenic places. Huangshan (Yellow Mountains): Dramatic granite peaks often surrounded by low-laying fog and know for its pine trees, hot springs, and winter snow. Guilin/Yangshuo: Forested kart mountains numbering in the thousands that envelop towns and villages, dense bamboo forests, and rice fields. Zhangjiajie/Wulingyuan: Sandstone pillars hundreds of meters high and thick evergreen forests of particular beauty during the winter as a wonderland of white. The Colorado Plateau is a huge desert region comprised of sections from four different American states: Arizona, Utah, New Mexico, and Colorado. This area makes up the heart of the American Southwest and is largely made up of high desert, with scattered areas of forests. It contains the the greatest concentration of U.S. National Park units and the most unique landscapes in the entire U.S., including eroded cliffs, badlands, hoodoos, sand dunes, domes, reefs, river narrows, natural bridges, slot canyons, fins, petrified wood, and ancient Native American sites. This guide is comprised of three separate reports with clickable links below! Utah - Under construction - coming soon! This guide documents the three types of landscapes that are only found in Iceland, if not very few other places on Earth: mossy lava fields, colorful geothermal mountains, and iceberg beaches. The scenes captured here are unmistakably “Icelandic” and are located outside of areas typically accessed by the majority of tourists. 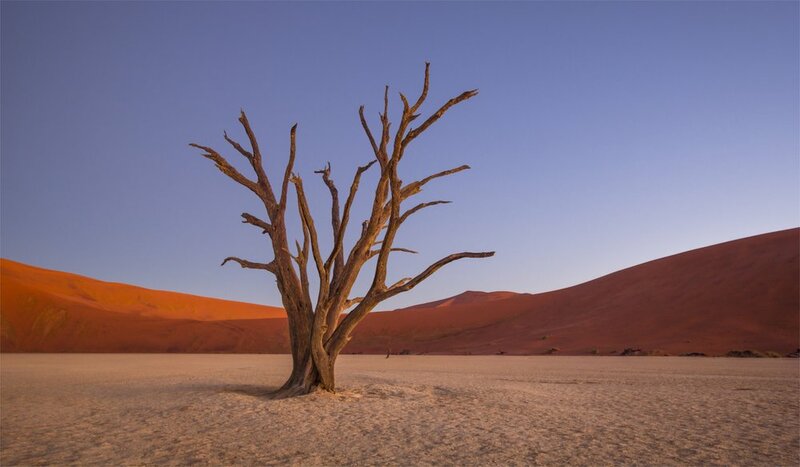 The Namib Desert is a land of superlatives. It is the most ancient desert in the world, boasts the tallest sand dunes on our planet, regularly hosts the darkest night skies that radiate the Milky Way, and contains trees found nowhere else on Earth. During my two weeks there, I attempted to capture the rich colors and serene isolation of this incredible desert. Greenland, one of the planet's last great wilderness areas. Most of the country is covered by an inhospitable icesheet but the very south, just below the Arctic Circle, is ice-free and home to the most dramatic mountains and fjords anywhere on Earth. This region of the country is hard to get to and took two planes, a helicopter, and two small boats to access. The following pictures are from a nearly two-week expedition that myself and five other photographers spent undertook exploring incredibly remote and unspoiled fjords, glaciers, icebergs, and granite peaks that rise thousands of feet - areas with no trails or established tourism. Like many Americans, I have special respect for our country’s largest and wildest state. It’s a place of superlatives with the enormous mountains and vast tracts of uninhabited wilderness. It’s also a wonderland for landscape photography, particularity those like me who love to capture mountains, glaciers, valleys, icebergs, and rugged coastline. I have traveled to the 49th state on three separate occasions and have only begun to scratch the surface of this huge place. Prince William Sound & Columbia Glacier - A huge body of water surrounded by mountains and covered in icebergs. Spelunking through central Vietnam is one of the world’s great adventures. The country is home to two enormous caves, Hang En and Son Doong - the latter being the largest cave in the world. Fewer people have been in these caves than on top of Mount Everest. The sheer vastness of these spaces are undoubtedly one of the world’s most stunning natural wonders. The Son Doong Trek is a week-long, 50 kilometers hike through 30 river crossings into the darkness. Descending into the main space, cavers can expect to cross chambers large enough for airplanes to fly through; lush, underground jungles; and rooms with gigantic stalagmites hundreds of feet tall. Many of the following pictures have porters standing in as tiny models in the distance because the sheer size and scale of some of these huge spaces would be incomprehensible otherwise. Between its deserts, mountains, coast, and ancient forests, California is without question the most scenically-diverse state in the United States and all of North America for that matter. The Sierra Nevada mountains and Yosemite/Kings Canyon dominate the east, rising above the surreal playas and salt flats of Death Valley. Giant Sequoia trees, the world’s largest, grow at the foothill of these peaks. Further south, the badlands and Joshua trees of the Mojave Desert stretch for miles across the arid land and surround the eerie Salton Sea. The beautiful jagged coast of Big Sur stretches along the Pacific Ocean overlooking towering seaside cliffs. Traveling north, the ancient Redwood forests grow, which are the tallest, and among the largest and oldest living organisms on Earth. In the far north, the Cascade range’s southern end begins with the beauty of Mount Shasta and the geothermal wonderland that is Lassen Volcanic National Park. The Cascadia Bioregion is also referred to as the Pacific Northwest Bioregion is the land of old-growth forest superlatives. The enormous, ancient trees that live here are among the tallest, widest, oldest, and most massive in the world with individual lifespans reaching 500 to 2,000 years. Cascadia’s forests have more than twice the volume of biomass per unit of area as the world’s tropical rainforests and support huge varieties of mosses, lichens, ferns, and shrubs in addition to countless mammals, birds, and insects. Generally, the following reports highlights the five giant tree species of the region: coastal redwood, western red cedar, Douglas fir, Sikta spruce, and western hemlock trees. This guide focuses on the specific forested regions within Cascadia with the largest and oldest trees, each with their own report (clickable links below)! 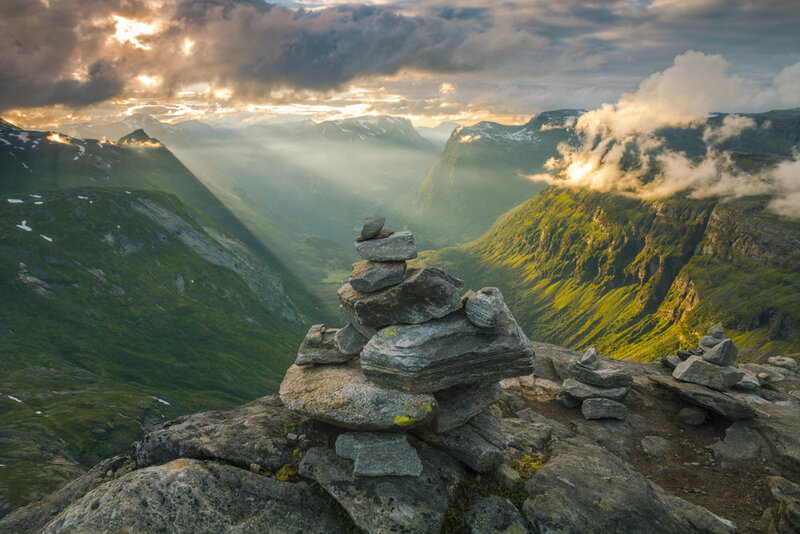 Norway’s epic landscapes can be divided into two main areas: the western fjords and the northern Lofoten Islands. Few places on Earth feature fjords as diverse and coastline as dramatic and mountainous as those in Norway. Norway is both cursed and blessed with constant rain, storm clouds, and unpredictable weather, which one must trek through to photograph the country in its rawest beauty. Like the rest of greater Scandinavia, some of the best light is found in mid-summer during the 20-hour daylight of the midnight sun. The combination of tumultuous weather and neverending light only enhances the sheer beauty of the absolutely enormous landscapes found in this country - landscapes that, in my opinion, rival those of Alaska and Patagonia. Like Alaska, Yukon is a northern wilderness of endless mountain ranges, forests, and icefields. Because of its sparse population, the Territory very much defines the words “wild,” “remote,” and “unspoiled.” Around the Whitehorse southern Yukon area, evergreen trees grow abundantly but as you travel north, the shorter and colder growing season only allows treeless tundra to thrive. The Canadian territory is a photographic paradise of vast uninhabited expanses, huge towering mountains, colorful foliage, and unrelenting weather. Rain is often likely but the weather regularly produces some of the most incredibly dramatic and menacing clouds - especially during the golden hours. Southern Peru is undoubtedly one of the most scenically diverse regions in the world and boasts some jaw-dropping natural scenery. In order to tour it properly, one most spend more than a couple weeks exploring the country and avoid simply focusing on the (admittedly beautiful) allure of Machu Picchu. The following trip report focuses on the four distinct landscapes found in Peru: mountains, alpine regions, rainforests, and desert. From the Cusco area, our group: trekked the beginning of the beautiful Salkantay Trek and witnessed the day’s wispy clouds light up Salkantay during sunset, explored the ruins of Machu Picchu after a brief clearing storm, climbed 17,000 feet to the shores of Laguna Sibinacocha deep in the Andes, and rode a rustic boat down the Amazon River through protected areas with one of the highest levels of biodiversity in the world. Around Nazca and the arid Peruvian coast, our group hiked and camped on Cerro Blano, the most elevated sand dune in the world, and explored Huacachina, the “desert oasis” of Ica and its bright red dunes. 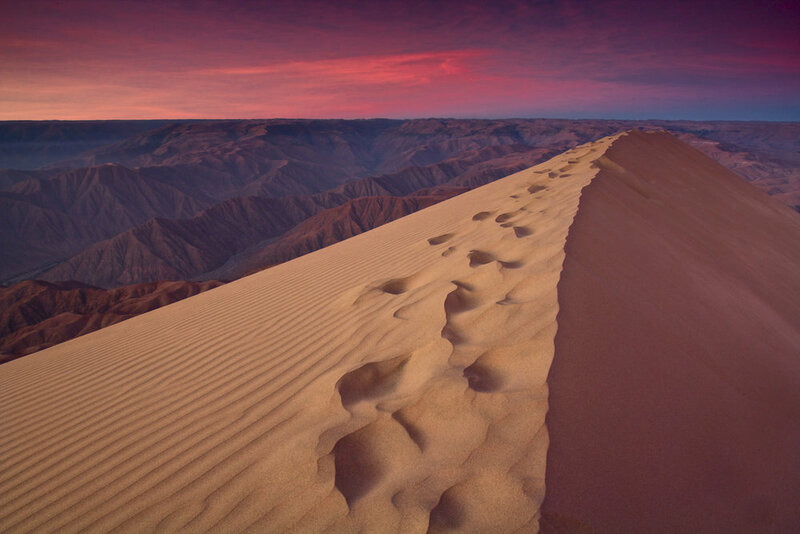 The Atacama is the driest desert in the world, as well as the only true desert to receive less precipitation than the polar deserts. In fact, some areas have not have received rain in recorded history. The volcanoes, rocks, and plants found in the desert are shaped by these extreme conditions. The Altiplano, mainly located in Bolivia, is the most extensive area of high plateau on Earth outside of Tibet. However, unlike Tibet, the Altiplano is dominated by massive active volcanoes. Both regions are extremely colorful and photogenic. In fact, besides the Colorado Plateau in the U.S., I have never seen a land so rich in color and contrasts.